Our black made-in-the-USA side-release buckles are durable and UV treated, to withstand exposure to the sun. Available in 1", 1-1/2", and 2". 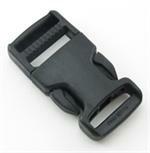 Other sizes are available in the imported version of black single-adjusting side-release buckles.